The Android explosion is well underway -- and now, the platform's app market is starting to reflect the growth. 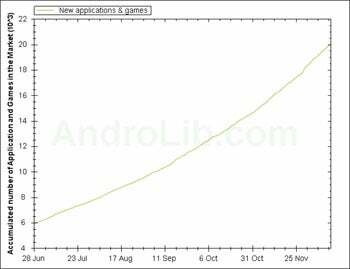 The Android Market has just reached 20,000 apps, according to the app-watchers at AndroLib. The numbers show Android doubling its app selection in a matter of about three months, jumping from 10,000 apps in September to 20,000 in December. While the 20k-figure may not be as impressive in sheer size as the App Store's 100,000-strong selection, that kind of growth is certainly a promising sign for the platform's future. Still, size isn't everything; it's what you can do with it that counts. The Android Market is rapidly proving it has the goods to get the job done -- and I'm not just talking about Google Goggles, either. The latest cool program to become widely available for Android owners is a must-have security utility called Mobile Defense. The app has been released in limited beta for some time, but it was previously accessible only to users on the T-Mobile network. Now, Mobile Defense has opened its arms to Sprint and Verizon, too, meaning those of us with the Motorola Droid, Samsung Moment, and HTC Hero can get in on the action. From what I've experienced of the program so far, I would highly suggest you do. Mobile Defense, put simply, helps you protect your Android phone in case it's lost or stolen. The app runs quietly in the background of your device, using a negligible amount of memory and battery power (in fact, its creator says the program employs practically no resources unless you're actively using it). When you install the app, you set up a secure account that allows you to log on from the Mobile Defense Web site. Then, anytime you can't find your phone, you simply sign in, click "Connect to Phone," and you're locked into your Android device. Mobile Defense will pinpoint your phone's location down to an exact address, even displaying it for you on an embedded interactive map. Within the same dashboard, you can remotely lock or unlock your phone and sound a loud "scream" (think obnoxious car alarm noise) through your phone's speaker. 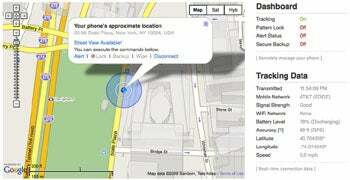 One reassuring aspect of the Mobile Defense app is that it doesn't rely solely on GPS data to track your phone: It uses a combination of GPS, cell tower triangulation, and known Wi-Fi hotspots to find and connect to your Android device. 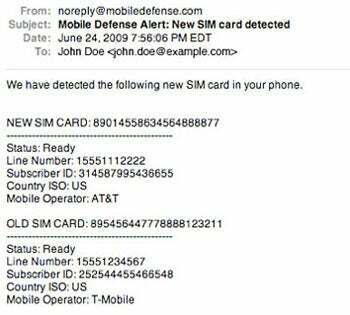 What's more, if someone tries to swap out your SIM card, Mobile Defense will alert you immediately via e-mail. It'll even give you the subscriber ID and phone number tied to the new card and allow you to issue "emergency commands" that your friendly neighborhood thief will be hard-pressed to block. There are a few other tracking/security utilities available in the Android App Market, and I've experimented with them all. Aside from its ease of use and consistent effectiveness, Mobile Defense stands out to me for its intelligent implementation -- while other Android security apps announce their presence upon the phone's startup, Mobile Defense doesn't display so much as an icon in the notification panel or even program list -- and also for its problem-free performance. Other security apps dragged down my phone's performance and caused various issues with my system; Mobile Defense has yet to cause me a single moment of grief. Oh, and I should also mention: Mobile Defense is free. Its developers have said they may eventually charge for some premium services, but the basic functionality available now, they've indicated, should remain available without a fee. Is Mobile Defense 100 percent foolproof? Of course not. But does it provide a powerful way to find your phone if lost -- and substantially increase your chances of protecting your data if stolen? Absolutely. For a free app that runs in the background without hogging any resources, those are odds I'm more than willing to embrace.